Tonight was the final night of the G3 tour which has played around 70 dates in the US and UK. 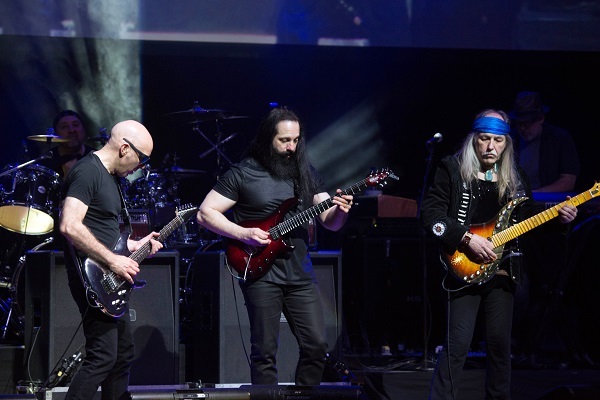 It’s a celebration of the electric guitar, so as well as Joe Satriani there are two other guitar masters on the bill – Uli Jon Roth and Dream Theater’s John Petrucci. The format of the night is simple – first each of them performs a set with their own band and then the night ends with them all coming together for a final jam. It’s enough to excite most guitar players, but as I found out, it’s not a tour that only appeals to other guitarists. Uli Jon Roth kicked the night off with a strong set primarily of Scorpions songs that included classics such as “Sails of Charon” with Niklas Turmann playing guitar alongside him and also putting in an excellent performance on vocals. Uli Jon Roth dedicated “We’ll burn the sky” to his brother Zeno who died earlier this year. While I’m not normally a fan of guitar solos where they don’t fit the song, Uli Jon Roth played a solo that saw the sound bounce from speaker to speaker as he demonstrated just how well he can play the guitar. It’s an excellent start to the night, and the set just flew by. Next came John Petrucci backed by Dave LaRue on bass and Dream Theater drummer Mike Mangini. His set was purely instrumental and based mainly around tracks from his 2005 solo album (Suspended animation), with “jaws of life”, “Glasgow kiss” and “Damage control” included in the set alongside a new song, “Glassy eyed zombies”. It’s much more of a heavy metal sound than Uli Jon Roth’s set, but no less impressive. Then came the man who organised the tour (and it’s predecessors), Joe Satriani. He’s a stunningly talented guitarist that stands out even when playing alongside talented guitarists such as John Petrucci and Uli Jon Roth, and is one of the few guitarists where I never think a track would benefit from the addition of vocals. Watching him play is fascinating, particularly when he plays “Circles” – his playing is like nothing you’ve seen before on that track. Tracks such as “Cherry blossoms” and “Satch boogie” sound fantastic, but before too long it’s time for the jam as he brings the others back on stage including Niklas Turmann as they start off with a Deep Purple cover, “Highway star”. It’s great to see them play together – sometimes all playing, sometimes taking it in turns to play something, and then handing off to the next person. We then get a Bob Dylan song, made more famous by Jimi Hendrix – “All along the watchtower”, with Uli on vocals, before they end with an extended version of Led Zeppelin’s “Immigrant song” with Niklas back on vocals – and taking a turn on guitar too. This really was a fantastic night even if you’re not a guitarist – there was so much talent on display, and it wasn’t a case of “I’m playing this because it’s complicated and shows how talented I am” – these guys are beyond needing to prove their talents, so they played what they enjoy playing. Yes there was some fiendishly difficult stuff played tonight but it never felt like showing off, just highlighting the range of sounds you can get from the electric guitar – the instrument that this tour celebrates. If you didn’t go to any of the dates, keep an eye out for any future G3 tours and go to one of the dates – it’ll be a great evening.